All Prospective Volunteer Coaches, El Dorado Hills Youth Basketball (EDHYB) has adopted the policy of performing background screenings for all new and returning coaches. This includes both head coaches and assistant coaches. If you are a minor, you will need a parents signature to process screening. Background screens will be performed by the National Center for Safety Initiatives in accordance with Recommended Guidelines for Background Check Screening in Nonprofit Youth-Serving Organizations published by the National Council of Youth Sports, www.ncys.org at no cost to the volunteer coach. For questions concerning rights and privacy, the volunteer is directed to the National Center for Safety Initiatives website located here www.ncsisafe.com. We are asking each coach/asst coach to complete the concussion training and email their certificate back to me upon successful completion. If you have already completed concussion training for another sport, please email me a copy of your certificate. Training certificates completed within the past 3 years will be accepted. As an all volunteer league, it is understandable that many of you have regular busy jobs and conflicts may arise with your job and games not to mention your own kids and sports they may be trying out for. However sympathetic the league may be, this is not a reason to request a change in game time. Due to the many games that we have each Saturday, the limited facilities we have available to us, the need for referee's and time keepers for each game, changing games is very difficult in impractical. The only acceptable reason is for the coaches that coach multiple basketball teams within our league. Please lean on your assistant coach for help covering times. If you do not have an assistant coach, a team parent can coach the game if they have completed the background screening process. Please allow 10 day for parent to be cleared. The parent can register and access background screening by clicking here. This link will take you to the registration page. Choose the option for "Head/Assistant Coach" registration and follow the steps. If the situation arises that you can't field a team (at least 4 kids) and must forfeit for any multiple of reasons, sickness of team members, conflicts due to another sport, injury, etc. please notify your opposing coach ASAP, as well as the league scheduler, so they can alert the officials/referees and time keeper coordinators. Looking for Extra Gym Time: We suggest that you look at using an outdoor location for practice as gym space can be limited at times. In the past some coaches had had extra practices at either a school, parent's house or park with success. USEFUL LINKS TO DRILLS, PLAYS, ETC. The links provided below take you to Breakthrough Basketball, a website that provides a ton of useful information. If you click on the age-appropriate link, you will find information on player development, drills, plays, offense and defense. We encourage all coaches to visit the site. If you are the HOME team , indicated by and (h) ,you ARE responsible for keeping the scorebook, please have your parent/scorekeeper arrive at least 15 minutes early to your game to observe/sit with the person keeping the book for the game prior to yours. If you have an 8:00AM game please be sure to explain to your parent how to keep score. It shouldn't take long to figure it out and if you are not familiar usually someone is around and able to help. The “HOME TEAM” COACH is responsible to report the final score of the game. Each coach will receive an automatic “score reminder” email the Monday after your game has been played ONLY IF the score has not been enter already by the other coach. The email will prompt you to enter your final scores into the website. The email will provide the details of your game as well as a link to enter your scores. Manually enter the score by logging into the web site: Click on the TEAM TAB and navigate to RESULTS. You will see your games listed and to the right is an ACTIONS column. Click on the edit button (looks like a square) and enter results. There will be a GAME SCHEDULE SHEET taped to the scorer’s table. Please write the final score next to your “game listing”. Entering a FORFEIT: Entert the score as 1-0. The "1" is for the team that didn't forfeit. Anyone who has spent any time in youth sports knows that if you have a great bunch of parents in a league or team, things are just going to ultimately work better. Right? 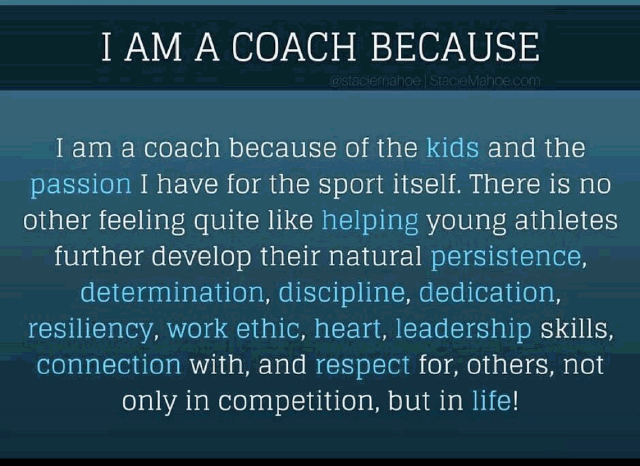 We all know this...The thing is, most coaches and directors just cross their fingers and hope and pray that things go well with the parents this season.The truth is, there is so much a coach can do on the front end of a season to make sure that the parents will be an asset and not a hindrance. I am totally convinced that every issue in youth sports can be proactively dealt with so there are no problems with the league. ...and I've proven it time and time again. But it all starts with the coaches. It's so much more efficient to do things right first than fix them later, isn't it? Here's a video I did to help coaches get the parents on their side right from the get-go.